Two Great Books for You to Read! Within the last two weeks, I read two books about Christian missionaries traveling to alien worlds. I recommend them both. Both are works of fantasy, yet both are grounded in reality, providing wonderful character studies and handling deep philosophical questions. 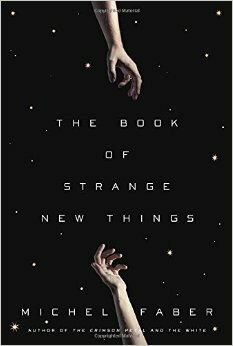 In The Book of Strange New Things by Michel Faber, Peter, an English pastor, is chosen by a powerful multi-national corporation to act as a missionary to the Oasans, people on a planet newly colonized by earth. Peter must leave his beloved wife, Bea, and their cat, Jacob. Bea introduced Peter to Christianity and their marriage has been one of deep love and total companionship. The difficulty of their separation and what it does to their relationship is one of the main focuses of the novel. The “aliens” that Peter ministers to are thirsty for knowledge of Christ, and we wonder why. We also wonder about the powerful muti-national corporation and its motivation for sending Peter. And what about the previous pastor who disappeared? And the linguist who taught the natives English and also disappeared? While the novel is suspenseful, it isn’t action-packed. The stress on Peter and Bea’s relationship also causes stress on their faith, and this is where the book excels. Its examination of love and faith in crisis is fascinating. 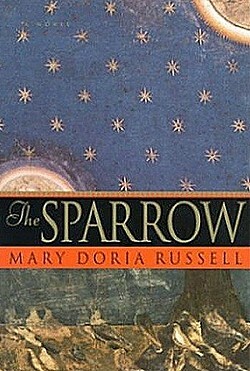 The Sparrow by Mary Doria Russell is also an examination of faith. Father Emilio Sandoz had it and lost it: why? Father Emilio Sandoz is one of a crew of Jesuit missionaries sent toward Alpha Centauri after radio signals demonstrate that intelligent life exists on a planet in that area of space. Sandoz is the only survivor of the mission. The book alternates between “past” and “present.” In present day, Sandoz is being interrogated by the Jesuits to discover what went wrong. He is accused of some horrible crimes. In alternate chapters, we learn about the discovery of the radio signals, the recruitment of the crew (all wonderful characters, that we readers fall in love with; Sandoz being the most wonderful), the trip across space, until the past meets up with Sandoz’s confessions. What went wrong? How did everyone die? How did Sandoz “go bad” ? This book has action, great characterization, and incredible world building. The author, Mary Doria Russell, has a PhD in biological anthropology, and uses her knowledge well. The development of the setting on the new planet–the cultures and languages and interactions of the races–is brilliant and probably my favorite part of the book. I was disappointed by the endings of both books. However…. After thinking about the ending of The Book of Strange New Things for several days, I changed my mind. It ends exactly how it should. I didn’t “get” it at first, but I do now. The Sparrow puts so much emphasis on what went wrong, what horrible thing happened, that its discovery was anti-climactic for me. I still recommend the book. I highly recommend both books. So, get reading! The Writer’s Voice/Pitch Wars competition featured many talented writers with intriguing concepts. I did not make a team, but I wish good luck to those who did and to their coaches. 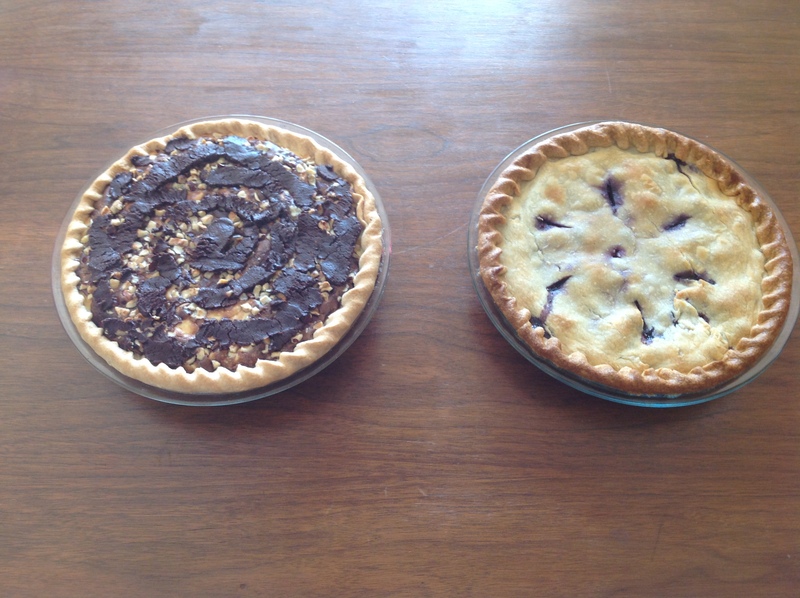 You can follow the competition at Brenda Drake’s blog. Follow me if you do that sort of thing. Immediately, I learned about #PitMad, a day in which writers pitch their completed novels in 140 characters, all day long. Wow! I should have gotten on twitter a long time ago! I participated in #PitMad and had some success getting noticed. I’ll be sending out queries over the next few days. So, though I “lost” on Writer’s Voice, I’m still a winner! 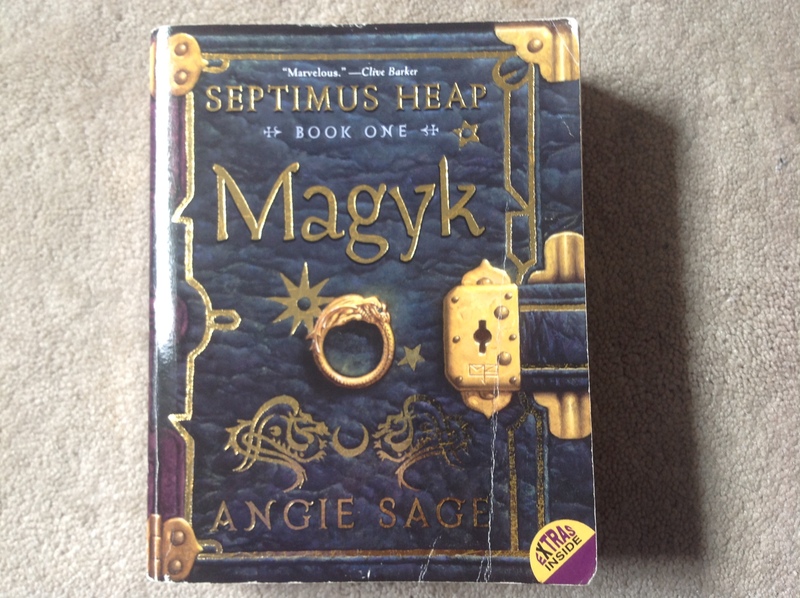 When my boys were little, we did a lot of reading aloud, including Angie Sage’s Septimus Heap books, a 7-book, middle-grade fantasy series about the seventh son of a seventh son. 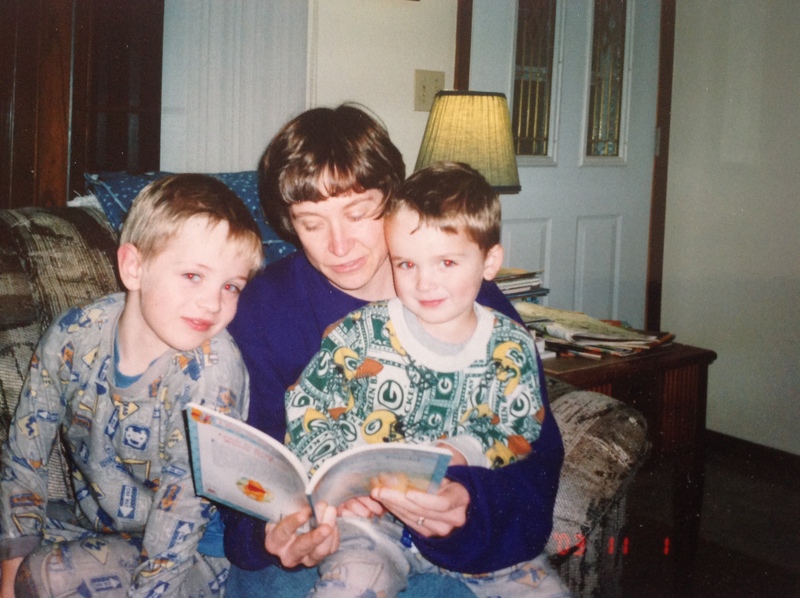 We read books 1-3, then got book 4 when it came out. By the time book 5 came out, we were reading them on our own, and I had forgotten so much about the earlier books, that I didn’t know what was going on all the time. I decided I’d wait for books 6 and 7 to come out and then start at the beginning again. And then the years went by and I forgot…. Until I found book 7 in a store two weeks ago and re-started the series. Wow! It is even better than I remembered. Angie Sage’s world building is fabulous. She has many, many characters and they are well developed and interesting. The plot moves like an out-of-control roller coaster. The writing is clever and funny. But the best thing. The most notable thing about this series: The number of female characters. The number of female characters either matches or is greater than the number of male characters. The female characters have important roles too. This kingdom is a matriarchy, with power passing from Queen to Princess. Ten-year-old Princess Jenna is a main character, as “main” as the title character of Septimus. There are male and female wizards, but the top wizard, the Extra-Ordinary Wizard, is a woman. There is a coven of witches (all female) and a female boat builder. A series about a boy named Septimus Heap, who is the seventh son of a seventh son, is going to have a lot of boys in it. And it does. But not more boys than girls. It is so rare to find as many female characters as male characters in a fantasy novel that this book seems female-heavy. Yet, when you sit down and count, the numbers of male and female characters are even. Just like real life. Is this important? I think so. Harry Potter has Hermione and Professor McGonagall and Bellatrix, but each of them stands in the shadow of a more important male character: Harry, Dumbledore, Voldemort. All the key characters are male. I don’t blame JK Rowling. Would her books have gotten the same attention if Harry had been Henrietta, the girl who lived? I doubt it. 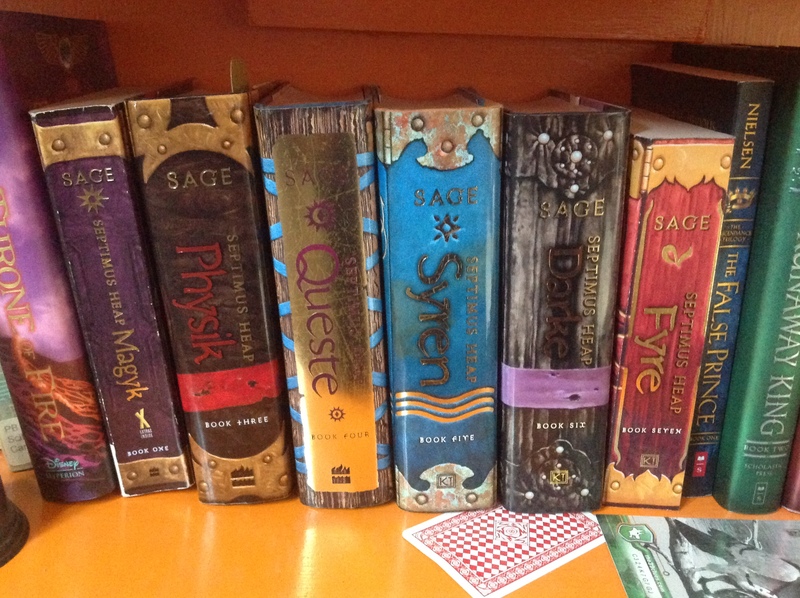 So, please, on this International Children’s Book Day, buy (or borrow) the Septimus Heap series (Magyk, Flyte, Physik, Queste, Syren, Darke, and Fyre) and read them to your favorite children. You will be struck by the number of female characters. But guess what? Your children won’t. For the past several years, my ladies book club has decide to spend the months of December and January reading children’s novels that have a chance at the Newbery Medal. We do a bit of research, come up with about 15 to 20 titles, then share the books. We meet in January and talk about our favorites. The Newbery Medal is announced at the end of January. 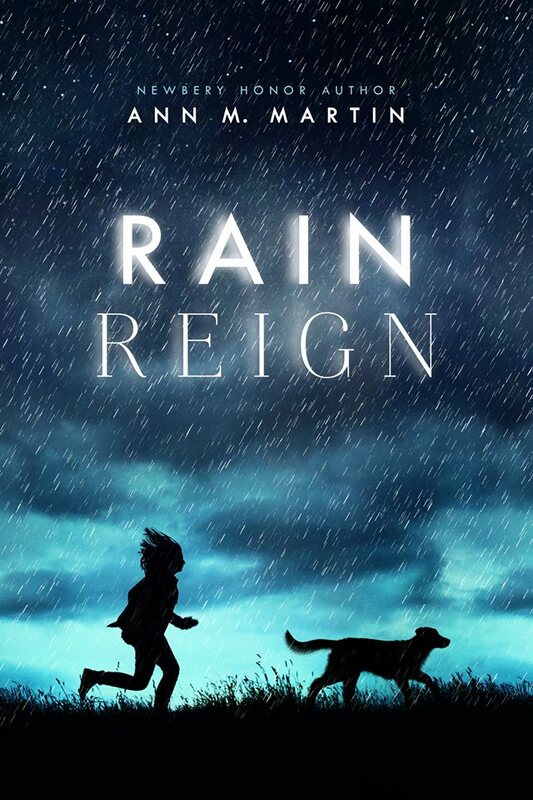 This year, the book I liked most was Rain Reign by Ann M. Martin. The story is about an autistic girl and her dog. It is a beautiful, beautiful book. I was extremely disappointed when the Newbery Medal was awarded to Kwame Alexander’s Crossover, a book I hadn’t even heard of. Well, I just finished reading Crossover, and I am delighted that it won the award. It is a wonderful novel-in-verse about two African American brothers who love basketball. I’m not male, I’m not African American, and I don’t much like basketball. It doesn’t matter! The story is brilliant and the writing inspired. Alexander’s poetry jumps off the page and sings in your head. Some poetry you have to read aloud to hear it as poetry, but I could hear the cadence and the rhymes in my head even in silent reading. 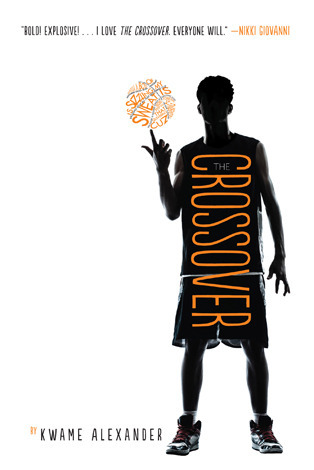 Crossover is not only a book for people who love to read, it is a book that will appeal to those who hardly ever read. So, hats off to Kwame Alexander and the Newbery Award committee. Great book. Great choice. 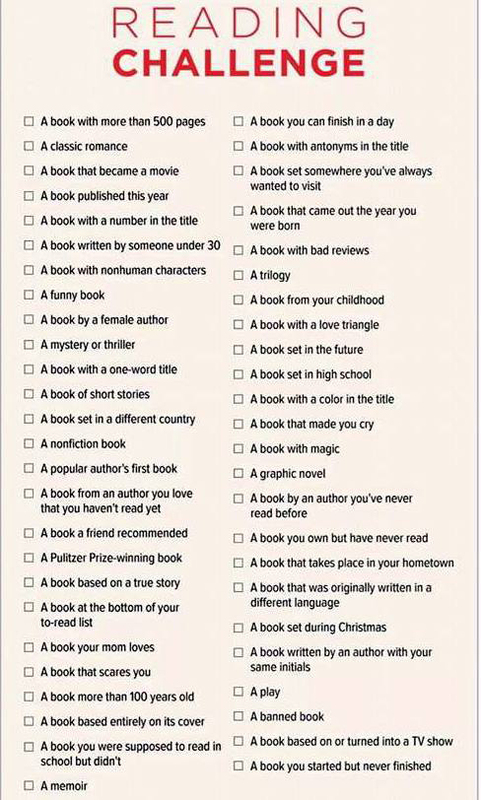 A Facebook friend of mine is doing a reading challenge, and I agreed to do it with her. I’m not sure where she found the list, but I printed it (when I decided to do the challenge) and through a google search (just now) found an online copy on the blog of children’s author Julie Stroebel Barichello. As the year progresses, I’ll match more books with more categories and post updates here. It isn’t too late to join the challenge!